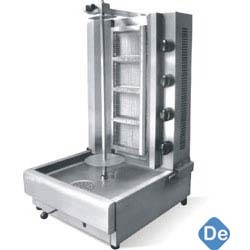 Gas/Electric Shawarma Grill Machine Manufacturer/Supplier in Delhi, Gas/Electric Shawarma Grill Machine in Delhi. We specialize in providing our clients Shawarma Grill that is designed ergonomically as per the set industry standards. Making use of excellent quality material and advance techniques, we ensure robust construction and durability of these machines. Besides, we offer these machines in varied power capacities and dimensions. We specialize in providing our clients shawarma machine that is designed ergonomically as per the set industry standards. We make use of excellent quality material and more.